REGISTRATION. 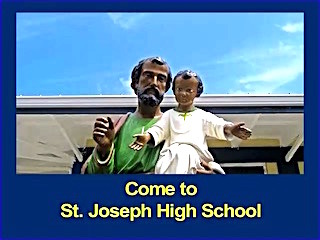 St. Joseph High School is looking forward to a wonderful new school year 2018-2019. Registration is at the school office Monday to Friday from 9:00 a.m. to 3:00 p.m.
MATRICULA. La Escuela Superior de San Jose espera tener un nuevo ano escolar 2018-2019 maravilloso. La matricula es de lunes a viemes de 9:00 a.m. a 3:00 p.m. en la oficina de la escuela. 29 years ago on September 17, 1989, Hurricane Hugo hit St. Croix. Read about St. Joseph Hig School in the Hurricane Hugo Articles in the Congressional Record of February 2, 1990. 1 year ago on September 19, 2017, Hurricane Maria hit St. Croix. On a Tuesday evening,, the Category 5, Hurricane Maria started to come near St.Croix and at around 2 AM on Wednesday the eyewall approached the west end of the island. St. Joseph High School is near the west end. Much damage was done to St. Croix but the main buildings of St. Joseph High School stood up well except there were other damages including to some of the trailers. Also electrical power and communications have been taking a long time before being fully restored. But we are recovering and were back in operation within 2 weeks of Hurricane Maria. Thank you for the prayers, they really worked! Hurricanes Irma and Maria inflicted major damages to the Catholic Diocese of the U.S. Virgin Islands of St. Thomas, St. John , and St.Croix. Please help with your prayers and Donate to the Hurricanes Relief Collection for the Catholic Diocese of the U.S.V.I. View the 24 minute video of Fr. John Mark, Pastor of St. Joseph Church on St. Croix, which was made during the Mass at Holy Cross Church on April 29, 2018. Fr. Mark had some words about the importance of Catholic Education and attending St. Joseph High School, St. Mary's School, and St. Patrick's School on St. Croix and also gave the sermon for the 5th Sunday of Easter. The entire Catholic Diocese of the U.S.V.I. experienced much damage from Hurricanes Irma and Maria. The Diocese also does much to help raise funds for the entire Diocese. That includes St. Joseph High School. Visit the website of the Catholic Diocese of the U.S.V.I. to find out more about how you can make a donation to the Diocese. Congratulations to theSJHS Class of 2018!18 SJHS students graduated from SJHS on June 17, 2018. 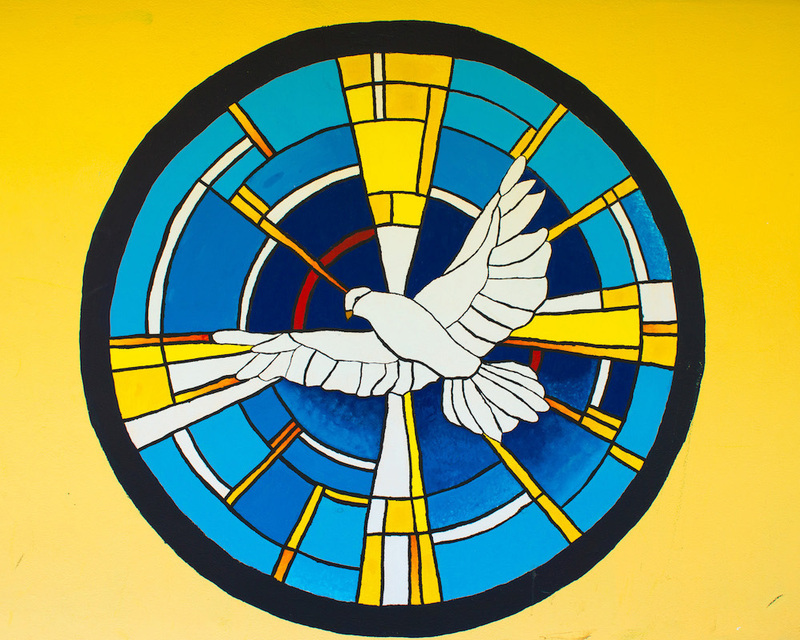 May the Holy Spirit continue to guide them in their journey through life.Photo of a dove mural, which is a symbol of the Holy Spirit, on the outside wall of the St. Joseph High School Chapel on St. Croix. Come Holy Spirit! Fill the hearts of thy faithful! And thou shall renew the face of the earth! 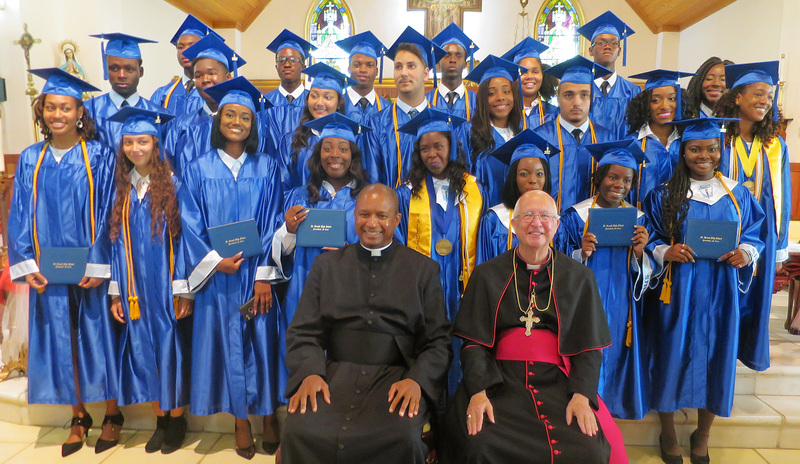 The St. Joseph High School Class of 2017 posed for this photo after the Graduation Commencement on June 4, 2017, Pentecost Sunday. It was held at St. Joseph Catholic Church from 3 to 5 PM. Seated in the photo are Bishop Herbert Bevard of the Diocese of the U.S. Virgin Islands on the right and Fr. John Mark, Principal of St. Joseph HIgh School on the left. The St. Joseph High School Class of 2017 posed for this photo after the Baccalaureate Mass on May 20, 2017. It was held at St. Joseph Catholic Church during the 5:30 PM Saturday Mass. 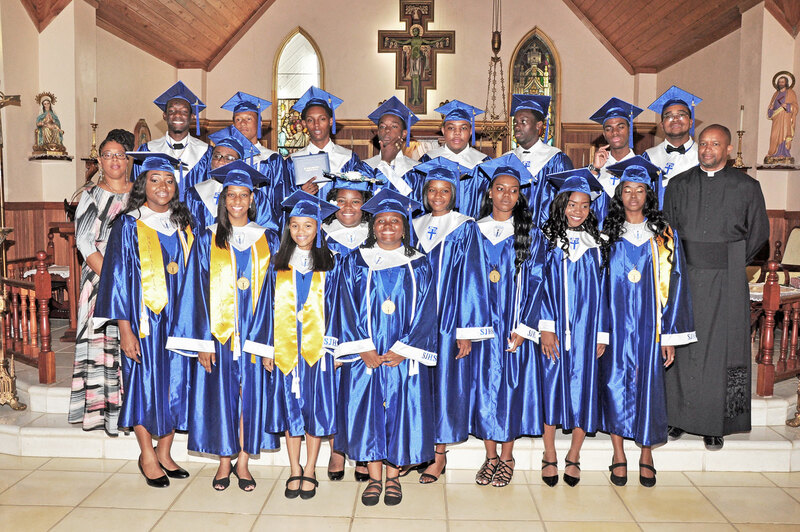 The Class of 2017 is scheduled to have their Graduation Commencement at St. Joseph Catholic Church on Pentecost Sunday, June 4, 2017 beginning at 3 PM. Some of the High Honors recipients are pictured on the front steps of St. Joseph High School after the achool Mass on January 18, 2017. 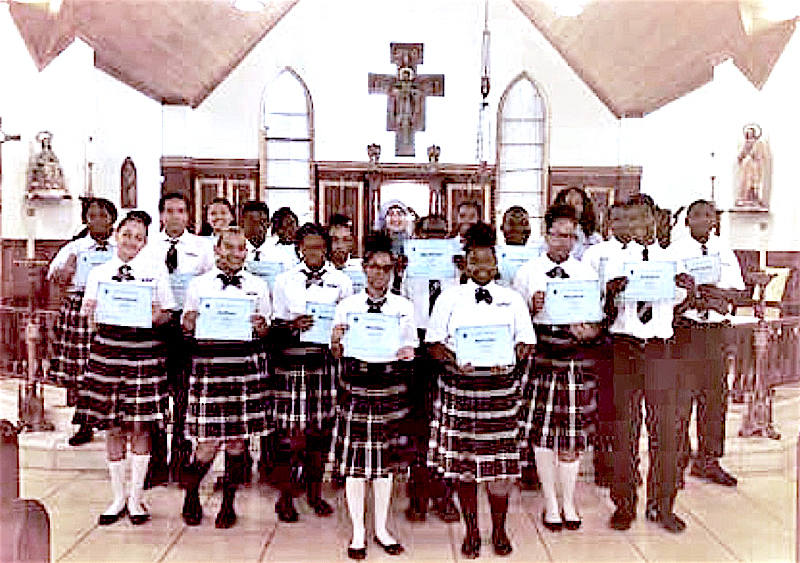 Some of the Honor Roll recipients are pictured on the front steps of St. Joseph High School after the school Mass on January 18, 2017. 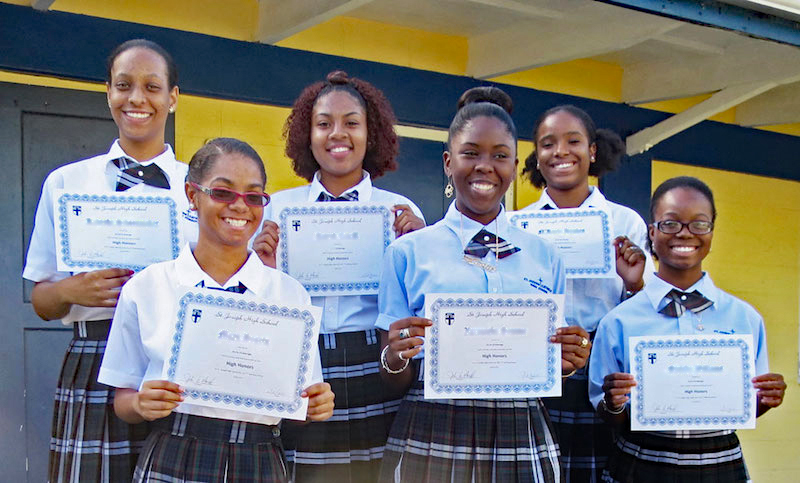 Some of the High Honors recipients are pictured on the front steps of St. Joseph High School after the achool Mass on November 9, 2016. 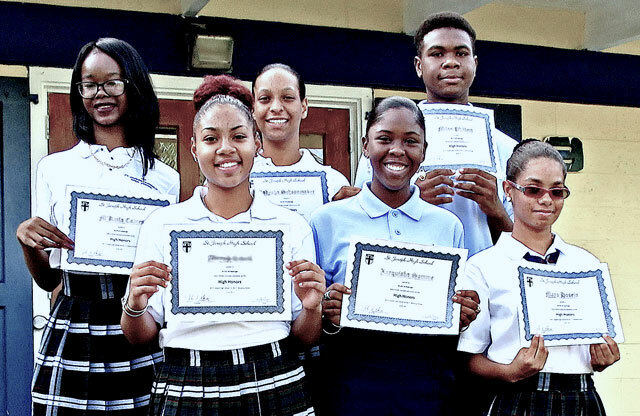 Some of the Honor Roll recipients are pictured on the front steps of St. Joseph High School after the school Mass on November 9, 2016. 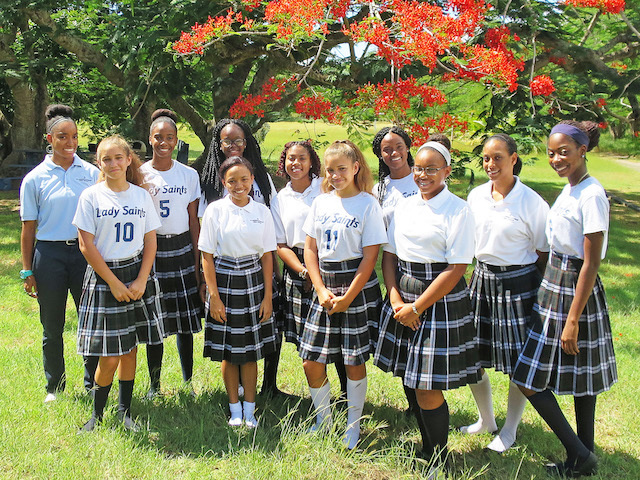 The St. Joseph High School Lady Saints 2016 Volleyball Team are pictured in front of the blooming Flamboyant trees during October 2016. 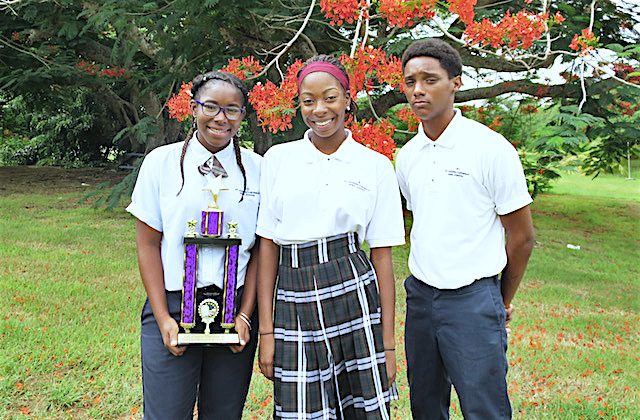 On World Food Day, October 16, 2016, a team of three St. Joseph High School students won a First Place Trophy in the Super Chef Competition which was one of the activities that took place during the World Food Day events at the St. Croix campus of the University of the Virgin Islands. 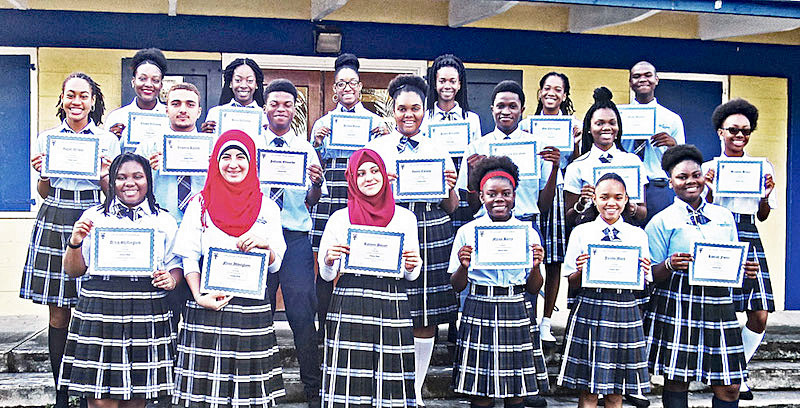 The three students on the team were Xiaxiang Washington, Team Captain, Grade 12; Kezia Williams, Grade 10; and Sevon Washington, Grade 11. 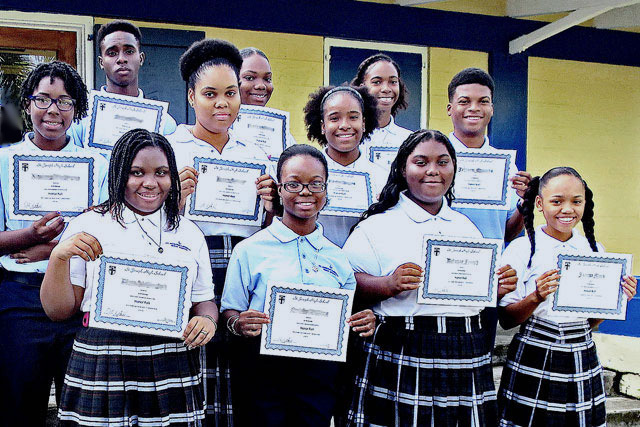 During the summer of 2016, Kadysha Schoonmaker, Grade 11, took part in a Coral Research and Conservation Program at the Mote Lab in Key West, Florida; Lailoni Cantor, Grade 10, took part in the Junior Statesmen Summer School Program at Georgetown University; and One' Carrington, Grade 12, attended a course at Brown University in Providence, Rhode Island. 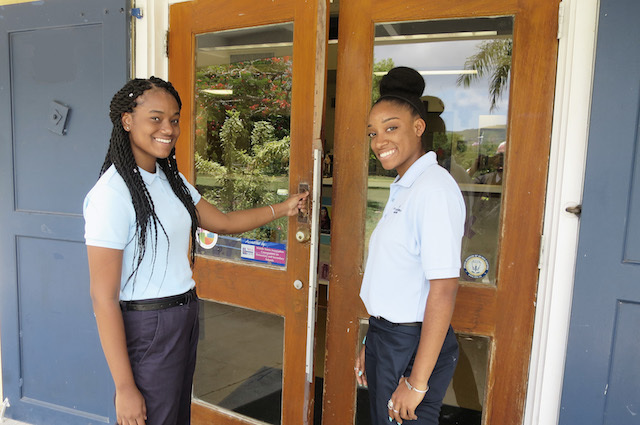 St. Joseph High School 12th grade students, Wadeema Berry and Djenne Green are shown entering the St. Joseph High School Office Building on the first day of the new school year on August 22, 2016.